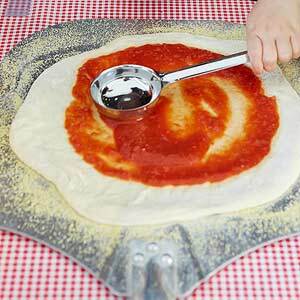 This dead-simple tomato sauce is the perfect consistency for spreading over pizza dough -- and since it uses canned tomatoes, you can make it any time. The recipe comes from Susan Cleverdon of Kinnikinnick Farm in Illinois. In a saucepan, cook onion and garlic in hot oil over medium heat until tender, about 5 minutes. Add remaining ingredients (except sugar), crushing tomatoes with your hands. Bring to boiling; reduce heat. Simmer, uncovered, 30 minutes, stirring occasionally. Let cool, then puree in a blender. (Or, if available, puree in pan using an immersion blender.) Season with sugar.